Humidification is one of those comfort issues. Some folks notice humidity, while others do not. Some people are quite susceptible to nose bleeds in drier environments. For some this is very dangerous, and humidification is more than simply a comfort issue. People who move up here to Utah from California find humidifiers in their homes a necessity. Relative humidity is the ratio of the actual amount of moisture in the air as a percentage of the saturation amount. The saturation ratio of moisture to air changes with temperature and pressure. The warmer the air, the higher the quantity of water vapor air can contain. 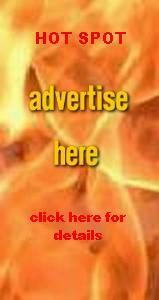 Air in your home attempts always to reach saturation point. The air will absorb water wherever it can be found. In your home, the air will rob moisture from your furniture, plants, your pets, and from you and your children's bodies. The American Society of Heating, Refrigerating and Air Conditioning Engineers (ASHRAE) recommends 40% to 60% relative humidity is ideal for today's homes. 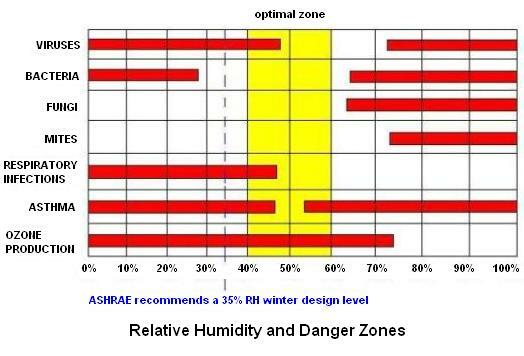 35% RH is recommended during the heating season in dry climates. Above or below this range, bacteria, mold, fungus, mites and viruses thrive. Be careful with humidification, though. If you have a constant high level of humidity in your home, with little or no ventilation, mold can form. Mold can be detremental to your health, your children's health, and your pets. If your home develops a stale, musty aroma, first in your basement or crawlspace, you may have excess moisture in these areas. During the winter months, a properly operating humidification system can save you money! For example, 68* F at 40% humidity feels just as warm as 74* F at 20% relative humidity. Hence, you turn down your thermostat and save 5% on your annual heating bill. A 1600 square foot home needs about one-third gallon of moisture per hour for good comfort. The formula is: cubic feet x .00028 = moisture required per hour for good humidification. A gallon of water weighs 8.35 lbs. above example: 1600 x 8' ceiling height = 12,800 cu. ft.
All humidifiers need to be controlled by a humidistat. The humidistat can be found mounted to your return ducting in your mechanical room, or it can be an integral operation of your thermostat. The first humidifier pictured above is a bypass humidifier. These units are quite popular due to price. This unit can be installed for about $350.00 to $500.00. It has an interior pad which is sprayed with water as air passes through the pad. This unit is best mounted on your return air ducting. A 6" round duct from your supply air plenum diverts air through the unit and through the water pad, water vapor is picked up and distributed through your duct system. 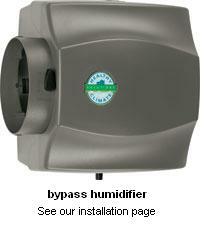 This bypass humidifier is best fed with hot water, and used on a forced air furnace, which is your primary heat source. The second humidifier pictured above is a powered humidifier. This unit has it's own small fan, which blows air through a water pad into your ductwork. This unit is also best fed with hot water, and should be mounted on your furnace's hot air plenum, not on the return ducting. This unit can be installed for about $550.00 to $700.00. 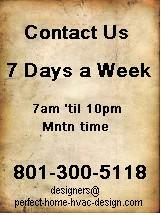 These are best used on furnace systems which are your primary heat source. Powered Flow-through Humidifier Installation page. The third type pictured below is a steam humidifier. These are great units, although they are much more expensive. 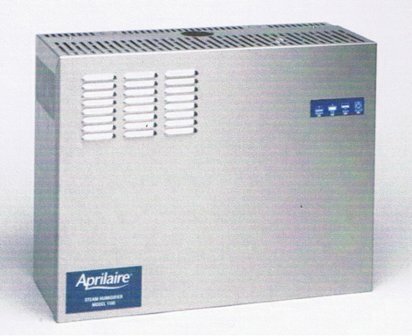 This Aprilaire stainless steel unit installs for about $2,000.00. A steam humidifier creates steam inside the unit, which is then injected into the air stream of your air handler or furnace. These are the best option if your primary heat source is radiant. With radiant heating, your air handler or furnace will be called upon to distribute humidification without a call for heat. 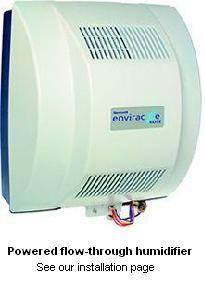 The bypass and powered humidifiers are not the best option for radiant heated homes. They need heat for proper humidity distribution. Usually the radiant system is first stage heating, and even if you have a furnace as second stage heating, seldom is second stage called upon for supplemental heating. Therefore, upon a call for humidity, the fan comes on and attempts to distribute humidity via a cold air stream. The bypass and powered humidifiers just do not perform well under these conditions. STEAM HUMIDIFIERS DO! Some steam humidifiers, Nortec and GeneralAire, amongst others, create steam inside a canister. The canister needs to be replaced about once per year. This can cost you about $150.00 after you pay for the service call. The Nortec and GeneralAire units are great units, once you get past the annual upkeep costs. Honeywell has joined the steam humidifier market with their "TrueSTEAM" unit. These run about half the cost, but also provide half the output. Most high capacity steam humidifiers run on 240 volt power. This Honeywell unit uses 120 volt power. Go to our Steam Injection Humidifier Installation page. The colder it is outside, the less moisture can be retained by the air. If the temperature is -10* set your humidifier for 20% RH. 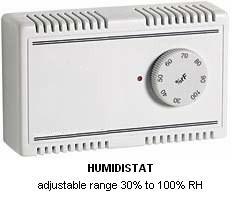 For every 10* warmer increase your humidistat by 5%, which means that above 20* your humidistat will be at 40% RH. All homes are different. Your home may need slightly higher settings, or slightly lower settings. Check your windows for condensation or frost regularly and adjust your settings a few degrees at a time. Equipmentwise, so far, all we have touched upon are whole-house configurations. Many humidifiers, including the above mentioned steam units can be fitted with a blower pack for a through-wall installation. Humidity equalizes in a home rapidly, but if the unit you choose is not large enough for your home, the unit will run constantly and never achieve set-point. Have your hvac contractor do the math to ensure that the unit(s) he is installing will, indeed, cover your needs. Turn off your humidifiers during air conditioning season. Air conditioning removes humidity. Humidifiers dump in humidity. The two are not compatible. Never mount your humidifier over an electrical panel or outlet. No other explanation necessary? Always install a secondary drain pan beneath your humidifier. A tiny leak can create an expensive repair. A wet switch can be installed in the drain pan, which will cut off the unit if water is detected. This will not help if the leak is in the supply water line before your humidifier.